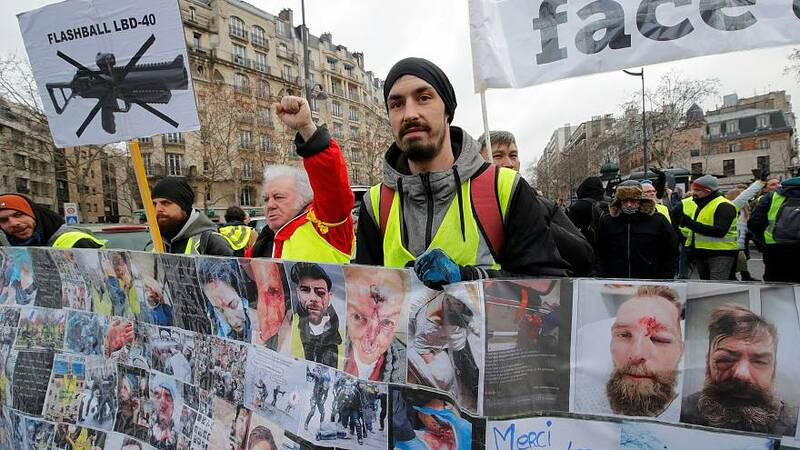 Thousands of “gilets jaunes” (yellow vests) protesters marched through Paris and other French cities on Saturday for the 12th consecutive weekend of anti-government action, as they paid homage to those injured by police in previous demonstrations. Participants carried French flags and placards denouncing the government of President Emmanuel Macron, while a large banner showing photographs of people injured in clashes with police took centre stage at the march in Paris. The protest came after France’s top administrative court ruled on Friday that police could continue using controversial rubber-ball launchers against protesters. Known as Defence Ball Launchers, the weapons fire rubber projectiles the size of golf balls, and have been blamed for leaving gilets jaunes with serious injuries including lost eyes and broken limbs. Around 1,000 police officers and 1,700 demonstrators have been injured since the protests began, according to official figures. The gilets jaunes protests — named after the fluorescent jackets French motorists are required to carry in their cars — began in November over plans to raise fuel taxes. However, they have since developed into a broader revolt against the government, with thousands of demonstrators taking to the streets every Saturday. Macron launched a "Great National Debate" in a bid to resolve the crisis.